Presidential candidate of the Peoples Democratic Party, Atiku Abubakar, has promised to reward PDP aspirants who contested in the primary elections. While speaking at a meeting with members of the PDP Board of Trustees (BoT), in Abuja on Friday, Atiku charged them and other leaders of the party to rally behind him in his quest to make life better for Nigerians. Atiku said that the sense of togetherness amongst the 12 who contested the party’s primaries in Port Harcourt recently, is an indication that the party is well positioned to take over power from the ruling All Progressives Congress in 2019. “I can assure you that I am prepared to work with and reward all of you if we unite together to achieve success. I must commend the sense of patriotism displayed by my fellow contestants. From the very day I delivered my acceptance speech, we have been working together. 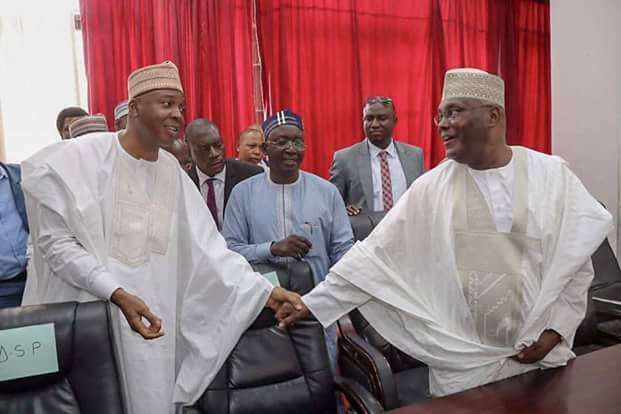 "I believe it is our duty to provide that sense of unity and leadership to the rest of party members,” Atiku said even as he gave a brief account of what transpired behind closed doors in his Thursday’s meeting with former President, Olusegun Obasanjo.